It is a solid nonseparable construction, which consists of an intraosseous screw part, a neck and a head. 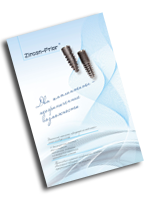 The self-cutting root-shaped implant has a parabolic form with screwed threads, which are adopted to the lyerwise trophic and reparative possibilities of a bone. The parabolic shape of the implant and the angle of lean of the threads 15° provide equal allocation of vectors of functional load. A biconcave neck assists the displacement of the wound canal of the mucous membrane in the attitude to the bone (switching-platform). The head of the implant has a shape of the truncated cone with the height of 7 mm. On its top it has a truncated cylinder with the opening for a tetrahedral wrench. length – 8 mm, 10 mm, 12 mm, 14 mm, 16 mm. diameter – 2,7 mm; 3,0 mm; 3,3 mm; 3,75 mm; 4,0 mm; 4,5 mm; 5,0 mm. Indications for the installation. These implants are installed, if the bone is the bone of the 1, 2 or 3 type, if the density of the alveolar process is from 3,5 to 5 mm and the density of the mucous membrane is up to 3 mm. These implants are used as a basis only for nonremovable bridges or as transit implants for temporary nonremovable constructions. The technique of the installation of implants. Under infiltration or block anesthesia, using a perforator, a part of the mucous membrane must be punched on the top of the ridge of the alveolar process in the projection of the installation of the implant. A cortical plate must be perforated with a pilot trihedral drill, after that a density of the cortical shell and the density of the spongy part of the bone (the type of the bone must be ascertained) must be determined. This gives us a possibility to value the way of the forming of the bone cana, and depending on this cone-shaped drills of this or that diameter are used. After the forming of the bone canal an antiseptic must be sprayed on it and the implant must be twisted in at first with a wrench with tetrahedron, and after that with a wrench ratchet. The implant is twisted in up to the complete immersion of the smoothed neck and head into the gum up to the stop. A part of the implant lower than the smoothed neck must be placed on 0,5 mm supracrystal. The terms of possible capacity are determined according to the bone type and the quality of the primary fixation of the implant.